Surprise. We are starting a week early – sort of a trial run – to see how this online-Bible-study-with-100+-participants is going to work. — Please read along as we go through the next 14 weeks, and contemplate the questions we’ll be tackling. It’s gonna be good! — We will be utilizing the comment section as a forum for discussion for the participants only. I respectfully ask that – if you are not participating – that you refrain from commenting on the Reason for God posts, simply to help keep things well… simple. — We have an incredible group of women representing various ages, faith backgrounds and life experiences – I hope you’ll check out all they’ll have to say. I can’t wait to see all He is going to do through this study and it is my prayer that the participants, as well as those of y’all who will be reading along, and those of y’all that just occasionally stop by, will contemplate your own faith and understanding of God in a new, and more purposeful way. Timothy Keller, in his book The Reason for God, describes our current culture as one in which both skeptics and believers feel their existence is being threatened by the other. Both secular skepticism and religious faith are, simultaneously, on the rise. We – as a culture – are growing both more religious and less religious at the same time with neither the western Christiandom of the past nor the religionless society that was expected to be our future. And the chasm between these two camps is deep and seemingly treacherous. Believers are urged to face, head on, both their cultural and personal doubts to Christianity. Skeptics are urged to wrestle with the faith on which their belief – their skepticism – is based, and to consider how handily they could defend those beliefs to those who do not share them. And, at the end of the process, regardless of whether or not our beliefs change, we will hold onto our beliefs with a new-found clarity and humility, and an understanding and respect for the opposing side that we didn’t possess previously. Question: Can you relate to what Keller says about the need for Christians to dissect their personal and cultural doubts? If so, what are your most pervasive doubts? If not, to what do you attribute your confidence? My response: Absolutely. My knee-jerk reaction to the question of “do I doubt” is that I have a natural tendency toward belief – not doubt. But when I dig deeper, and really get honest with myself and how my actions reveal what I truly believe, I realize that I have doubted. And still, in some ways, doubt. And although those doubts have been long-hidden, they still color everything I do and everything I believe. My most pervasive doubts have probably been about the character of God. Who is He? How can we know Him? How can He manage the universe and still have the time and the inclination to hear my often-seemingly-unimportant prayers? Does He really care about me? I can relate to Keller’s admonition for Christians to know, understand, and be able to justify their beliefs. Peter tells us to always have a reason to give for our hope which is in Christ Jesus. I have seen God’s hand at work in my life and in the lives of my family so much and so often that I know beyond the shadow of a doubt that God is real; Christ’s salvation is a done deal; His salvation is a free gift to me; and I have the promise and reward of living eternally with him. How do I know these things? My faith. Hebrews 1:1 says “Now faith is the substance of things hoped for, the evidence of things not seen.” I know, even though I cannot “see” Him, that God exists and is all He says He is, because I have faith. My faith IS the evidence of God. That I have faith at all is a result of this real God; His real plan for me; and His real love for me. His perfect love drives away my fears and doubts. Hallelujah! love this! faith can be so difficult to explain to others…and, yet, you know from the depths of your soul that it is nothing you mustered up on your own. it is real! Very interesting and love how we are starting off with a bang, a hard, tough and thought provoking question. Hmmm, pondering here because really neither answer (yes or no) from my life circumstances is an answer I am proud of. I was not raised in a Christian home but became a believer at 13. From that moment on until I was in my 30s I accepted the beliefs of others as my own, I never once questioned why I believed what I believed until then. It was then that I began to ask, to doubt, and dig into why I believe what I believe (or what I thought I believed). To my horror, some of my beliefs had no Biblical basis, they were more cultural beliefs. I must admit that I still am uncovering beliefs that have to Biblical basis….just handed down to me. Do I doubt? Wow, Stef, loved your thought, it is my actions and reactions that really tell my beliefs. As I read somewhere, if all Christians truly believed we would all be shouting the gospel to the top of our lungs. Just as if someone was standing in front of an oncoming train. But I do not shout, I live in my safe little world, with my safe little friends and talk about God to my safe people. Hmmmmm doesn’t sound like much of a believer huh? Often I do doubt that of all the people on this earth, does God care about me, does He see me, does He hear me. I know beyond a shadow of a doubt He can do anything but, will He do anything for me. In the last study “Knowing God” I came to places that I have never been in my walk. He is working on me for sure. Love this thought. It’s something I hadn’t considered and so very true! haha…i read your words before i looked at your name and, when you got to the part about questioning God’s love for you, i thought, “oh she should read Knowing God!” i think since you already said what i was going to say, i don’t have to post! haha! Can so relate to having ‘inherited’ beliefs… without even KNOWING it! He is so full of grace, compassion and patience for us as we wrestle with our doubts – such love is hard for me to comprehend. I have so many times found myself questioning what I truly believe because too often I do not see my life lining up with what I believe leaving me to realize my doubts. I mean, if I truly believe Him to be who He says He is why am I not on my face before Him 24/7. I certainly feel my life should look a whole lot better than it does, that I should not be the insecure Christain that I am, but that Christ should reign mighty in me. It’s not that I don’t believe, mostly there is just so much I don’t understand. There is so much contradiction within the body of Christ that I come away confused more often then I come away feeling confident in His Word and who He is. Suffering, especially the suffering of little children is an area I really struggle with. I know God is good, I don’t doubt that. I realize I can’t see what He sees, I don’t know how all the puzzle pieces fit together and that I believe is where faith comes to play. Do I trust Him or not? I choose to trust even though I do not understand, however I still question, I still struggle, I still hurt and I have doubts because I just don’t know all things. I recognize that it is okay to doubt, but in our doubts we need to ask God to help us with our unbelief and trust He will. My most pervasive doubts. Two came to mind quickly. How is there so much suffering in the world, when a loving God that could prevent it exists? It bothers me often. I know the rhetoric of “we live in a fallen world”, and it seems like that is the standard answer for anything “bad”. And I know that’s true. Watch the news any day of the week, and there is proof of this fallen world everywhere. But where is God in all that? Sitting on the sidelines? Not caring and protecting? God is called our Heavenly Father, but that doesn’t seem like good parenting to me. It all makes my head swim. And the whole forgiveness thing gets me every once in a while. Mostly because I have problems with forgiving myself. I know how ugly my heart is at times. How can a perfect God ever get past that? I know it’s through grace and mercy, and I truly do believe that I am saved and have been forgiven of my sins, but there are moments where Satan gets a foothold and brings up things in my memory that I really fall back on my heels and say “yep, that was a DOOZY of a sin. No way God’s going to want to take me after THAT one!”. And yet with all these doubts, I KNOW God exists. He has been active in my life in so many ways I can’t for a second doubt His presence. I know He sees ME. I know He sees my children. He has never abandoned me (even when I abandoned Him). I hang in there, even with my doubts, because He has simply given me too much proof to believe otherwise. oh, i replied and the computer crashed! i think we all have or have had similar doubts…good thing we start off CHP 1 with suffering because we all wrestle with it. if you haven;t read Packer’s Knowing God, I highly recommend it! so many of us in the last study really grew in our understanding of GOd’s amazing love for us through that book. I am so looking forward to digging deep into how Keller deals with this subject. As I have studied, I have come to understand more fully why the world is as it is. But I could certainly use more truth on the matter, especially when the time comes for me to defend my faith. I was so thankful that Keller was able to take doubts out of the closet of shame… and allow them a real yet visceral place in the heart and the life of the believer. Doubts are, in my opinion, too quickly swept under the rug, especially in Christian circles, and I think that is a real shame: both to the doubter and to those who could come along side to help. So, am I doubter? No question: the answer is a resounding, “YES!” Having been a Christian for all of my adult life, having been raised in God-fearing Christian home, having attended every Sunday school, Awana class or summer camp—I have had problems owning my doubts in the past. But, now, I embrace them, talk about them often, and am willing to let them sit and take up residence for awhile. Several years ago, I had a major crisis of belief. I struggled with arguments about science, suffering, pluralism, but at the core, I wasn’t sure I believed in the existence of God. It has been a long three roads back from that basin of futility. And, to get to the place where I am today—which is to say that “Jesus is the Christ, the Son of the Living God”—has meant that I have had to build my faith back little craggy stone by little craggy stone. And, I have had to let doubts exist for long stretches of time… many still exist. But, what I know now, is that doubt only makes my faith stronger. I don’t run from my doubts; I don’t attempt to find an immediate answer. All to say, I am more comfortable with doubt than I have ever been… and paradoxically, my faith is wiser and stronger than it has ever been. “I am more comfortable with doubt than I have ever been… and paradoxically, my faith is wiser and stronger than it has ever been.” — I love that, Erin. I am constantly amazed that God is never worried by our doubt. He has nothing to hide – no shifting sands, no secrets hidden in His closet. He IS Truth! So all our questioning and asking and seeking doesn’t bother Him – He only cares about the posture of our heart. He wants our eyes and hearts to be open to the truth as He reveals it. great stuff. love the “closet of shame” statement because it seems like we beat ourselves up for any questions we have about our faith. Keller is right on in calling Christians to dissect their personal and cultural doubts, and I think we need to start by first acknowledging that Christians have doubts! And it’s ok! SO often we think that if we admit to questioning God, other believers will think our faith shallow and unbelievers will say, “aha! see, you don’t even know what you believe!” But if we can get our eyes off of other people and onto God, perhaps we will start to see our doubts as simply springboards for seeking God and knowing Him more intimately. As we spend time with Him in prayer and His word, He will give insight and answers as He purposes but, more importantly, He will give us Himself. 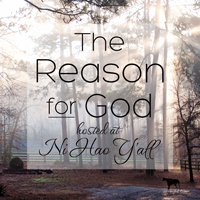 When my mom passed away at an early age, I refused to question God about it. I just kept saying, “I know You are good, and I will not doubt You.” In hindsight, I think that if I would have gone to Him with my questions and wrestled through my feelings with a sincere, “Why, God?”, I would have grown in a deeper understanding of His sovereignty and goodness. I would have received the peace and comfort that He was ready to give and, therefore, come to know Him more intimately. So…at times I do have doubts ranging from God’s love for me to the power of prayer to how do I share God’s truth with others in an articulate way to why can’t I live in San Diego! ?…but I now see doubts as opportunities to grow. “I think that if I would have gone to Him with my questions and wrestled through my feelings with a sincere, “Why, God?”, I would have grown in a deeper understanding of His sovereignty and goodness. I would have received the peace and comfort that He was ready to give and, therefore, come to know Him more intimately.” Such wise insight, Tish. I think I experienced this when Esther died – I went straight to Him with my grief and questions and was amazed at the peace and comfort He gave. Not answers (which, it turned out I didn’t need after all) or even relief from my grief, but a perfect, amazing peace that was unquestionably from Him. And I never once doubted His love for me. Still not sure how He did it, but He IS God! My doubts are in the church – not necessarily in my beliefs about God. I tend to keep the two separate. I absolutely KNOW that God loves me and I feel that deep in my soul,as I have since I was a little girl. However, I struggle with the belief that the “church” really cares about people in a sincere way. I haven’t experienced good relationships in churches through the years and so I tend to doubt the sincerity of the church – even though I am a believer, and therefore part of the church. I don’t know if I am explaining it well. I think there is healing that needs to take place for me, but I need to trust the Lord to work that out in me – if I get enough courage to allow Him to do so. I can relate. My first real involvement in ministry left me with similar feelings, but a friend told me, “you are looking at the man and not what God can do through the man.” Not that we should let ourselves (the church) off the hook…but I am reminded that, without Him, none of us would sincerely care for others…without Him, I would not love anyone but myself. With Him comes a pure and sacrificial love for others…though, unfortunately, it does not happen overnight! Thankfully we can worship the Lord ANYWHERE! And once we began looking for a church based on their priorities – Bible based, Jesus-centered, mission oriented, community involved – instead of based on their ‘denomination’ we were able to find a place to really get connected and learn. Tish is so right, we have to keep our eyes on Him, people will always fail us. But fellowshiping with other believers is essential, and so good for us, you just have to keep prayerfully seeking where He wants you to be! I might make a gentle comment here that I am currently Episcopalian and my church actually has all of those qualities, so yes, denominations shouldn’t necessarily be generalized as they might share a title but differ vastly from church to church. You are absolutely right, Brandy. Forgive me – and thank you for pointing that out! I have issues with the “church” as well. Not as it is described in the bible but with the men who abuse their power here on earth. I have issues with the _people_ in the church, heck, people _period_, and the pain they cause me and others. But it especially hurts when its people in the church. I am working w a Christian ministry with 6 board members. It’s one big fat ugly mess of an organization and you wanna know who has been the meanest most aggressive and ego driven of them all? The pastor! So much so that I’m coming to believe he was absent the day they taught the fruit of the Spirit! My word! And so my question is…how? How do I separate the man from the church? Keep my eyes on God? How? When this jerk rips me apart limb from limb in a board meeting and the other jerks sit there and dont say a word. How? When all I want to do is have revenge and get this guy exposed in some big time trouble? How? when this is a very loooong line of men and church leaders who have caused me and my family and I’m sure some of you very deep pain? Can y’all share the rubber meets the road practical ways you “keep your eyes on Him”? Thanks everyone for your replies. I know of so many people who have been hurt deeply by the church, as I have been. Hopefully, this study will help me to keep my eyes on Him and not on the weaknesses of people. It just is so hard when the church is the root of someone’s pain. I hope to learn more about my personal faith in the Lord and gain strength in that way, so that maybe one day, I will have the courage to be an active member of a church group somewhere. I’m going to take it one step at a time. This is such a wonderful way to begin this study! What wonderful insights that I have received already! I became a Christian at a young age and grew up in a Christian home. I don’t remember having any doubts ut God or my relationship with him. However as I grew older I felt more and more doubts creep in to my heart, Especially after losing both of my parents in my early 20”s. I have always felt truly ashamed that I doubted God. It is so comforting to realize that there are other Christians who are having the same struggles. I have always gone to to God with my Heartaches, and needs. Yet I have never been comfortable questioning him. I can imagine that losing both your parents would lead to many questions – so sorry for your incredible loss. As far as having doubts, you are in good company here! And I think bringing them out into the light is so essential to finding answers and allowing God to fill in those dark corners with His light and His truth. Yes, I believe it will make me stronger in my faith and walk with God by digging deep into these doubts. By finding the answer I can get rid of the doubts and be stronger in my faith. I sometimes doubt that God is going to keep forgiving me over and over for the same sins. However in that same thought I know he exists and know he loves me and will forgive if I just keep asking and growing closer to him. Some days I just can’t imagine (in my worldly mind) that someone and something so wonderful can really exist. There are days when I wish I would doubt more so I would dig deeper and grow in faith and be able to confidently talk to others and answer their questions. I grew up in church. It has always been a part of my life and I just accepted what I was taught. This isn’t good for explaining God to others. I know he exists and I know he is right here with me at all times, but explaining this to others is not easy. I feel doubting can be a good thing in our walk in faith. I think doubting is seen as a weakness, but it can actually make us stronger. I so want to be able to answer others and bring them to God not turn them away by my lack of sharing or explanation. I am so glad I am doing this study with you guys. Reading through these comments has already been a blessing and I know this is only going to get better. “I know he exists and I know he is right here with me at all times, but explaining this to others is not easy.” – so true! I have the same thoughts about God not forgiving me over and over. I don’t think it is possible to truly explain “God’s Love” to anyone. You can try to explain it, but a person has to be willing to hear it with an open heart. “Some days I just can’t imagine (in my worldly mind) that someone and something so wonderful can really exist.” Me, too! The enormity of it all is just so overwhelming sometimes. But, then I read Job 38 and 39 and He reminds me what’s what! I bought this on my Kindle, and have never seen or flipped through a hard copy. I read the question that was posed about the introduction before I read the introduction. I read the introduction, re read the question, and thought ” My most pervasive doubt is that there is only one religion and one way to get into heaven.” I then decided to keep reading. That was what the very first chapter is about and I had to laugh. you will have to share your thoughts on this doubt at the end of the book! Me too Kelly! I struggle with the one religion and one way to get to Heaven thing too, as well as believing in Hell. If we have a forgiving God then there shouldn’t be a Hell right? Where do all the truly evil people go? I hope not with the rest of us! Can’t wait to get these questions answered. The earlier we acknowledge our small doubts and dwell in them, pray through them, perhaps gives us strength such that when a bigger blow comes along we are grounded in our belief all the more. Just as it is imperative question our teachers, question the books we read, the information thrown at us from media, it is important to not brush away our doubt but rather question where we are and how we got there and where to go from here. I struggle so deeply with the great chasm between the two groups Keller describes; my family and husband’s family come from one tradition/belief and we are in another. Sometimes it is hard to be where we are when so many of our family members disagree and I doubt/question it at times. I also struggle with the unquestioning thought that the Lord pre-ordains each of our steps in life/circumstances. It seems a little ridiculous to question that after marrying the perfect man, having the career I wanted since age 12, and being nearly 6 months home with our adopted daughter and life is smooth with wonderful attachment, but I think about those for whom it isn’t. My career isn’t what I thought it would be. your comments about questioning makes me think of the Bereans from Acts 17! Jan, I so hear you! I am very excited to be doing this Bible study with y’all!!! I can not wait to find out what God is going to reveal to all of us!!! I think I spent the entire time reading nodding my head. Yes, yes, yes. I never would have thought of half the things he brought up, but I found myself agreeing with so many of them. I just finished grad school for statistics and the majority of people around me were people who gave up on God or never really believed in Him. I am 100% certain that I could not have made it through school without God. By relying solely on him to get through it, my faith has grown so much during that time. This intro helped express that divide that I’ve been living for the past few years that I never even considered. I always had my church friends and my school friends in two distinct groups, never trying to merge the two of them. I’ve wanted to get better at being able to defend my faith and talking about God with people who are not Christians without being annoying. I already feel like I’m learning so much and it’s only the intro. I can’t wait to see what happens with the rest of the book! Now, to actually answer the question. 🙂 I definitely have doubts and fall into the category of someone who is trying to hide those doubts, both from myself and others. My main doubt is why would God care about me? Enough to die for me? Really? I know a lot of people who won’t even talk to me, so why would God want to? I’ve always been the awkward new kid. Anyone else move all the time too? Sometimes I think if I can’t even have any long term friends, why would God want to stick with me long term? I can’t believe I just typed that…I better click the post comment button before I get scared and change my mind about actually admitting that out loud. Do you have pets or children? If you have ever loved something helpless that depended on you for its care that would be the closest thing to God’s love we can ever experience. Before I had kids I had a Jack Russell that I loved whole heartedly. I couldn’t imagine ever loving anyone that much. Then I had a child and it was like having my heart walking outside my body. He is so much greater than we can comprehend and He loves you so much more than you can imagine simply because you are HIS!!! I was awkward in school too. I grew up with a house full of boys and longed for a sister all my life. Then I became a christian and the sisters I have in Christ are better than I could have ever hoped for. Welcome to the family! I don’t have any children, but I do have a Rat Terrier. I definitely love him a lot. I never connected to the God loving us like his children with that perspective. I am blessed with two incredible parents, so I try to think of God as loving me like they do to the extreme, but sometimes that doesn’t always work. Definitely never thought about it as how much I love my dog. Thanks for the insight! The fact that I am His always makes me smile when I hear it. For some reason, it’s really easy for me do doubt it. Maybe I need a neon sign above my head that says it to remember it! I’m glad I’m not the only awkward one! I have sisters and always wanted a brother. One my age to be exact. I wanted to adopt a brother my age, but my parents didn’t quite feel the same way. I definitely have those close friendships with some people the Christ too, the ones where they are family. It’s awesome and a huge blessing! I know I wouldn’t have even close to as much faith as I do without them. It still feels weak to me, but I keep trying to think of the mustard seed and how it grows too. Thanks for all the encouragement and it’s nice to meet you! We have been studying a lot lately on why we believe what we do. Our church went through the Truth Project. Then we did Truth U. It really provided me with more head knowledge to discuss my beliefs with skeptics. It gave the science and secular research behind many things in the bible. Too often, discussions with non-believers boil down to an individual world view. And there is no way agreement will be achieved. Personally, I have many doubts. These doubts stem from my own stubborn heart and the inability to completely accept Christ’s incredible love, grace and mercy. I often ask, “Why?” or “I don’t deserve this.” or “I can’t accept it.” Due to past traumas I doubt God’s total love for me. I doubt all ways he loves us as listed in Ephesians 1. I know we are chosen, holy, adopted, cherished, redeemed, forgiven and loved. I just don’t believe it is really true for me. “I know we are chosen, holy, adopted, cherished, redeemed, forgiven and loved. I just don’t believe it is really true for me.” You said so well just how I feel! Wow you ladies are so articulate and write your thoughts so well! Here goes: I was raised in a church that felt their particular denomination was the only Christian church that had all the answers and going to heaven. Perfection was key (at least as a child that’s how I understood what I was being told). I was terrified of hell and knew I could not avoid it. I once asked my mom what would happen if I died with one sin I had forgotten to ask forgiveness for and was told I would go to hell. Yikes! I was baptized at 12, on the ride home secretly wished I would die right then so I would die sinless and go to heaven. ( I really didn’t understand what GRACE was did I). Fast forward to my 20’s and I totally turned away from God and pretended he didn’t exist. I’m in my 40’s now and just beginning to accept God back into my life. Reading through some of your wonderful comments, I have found that some share my long held doubt of being unsure of God’s forgiveness but desperately wanting to know it’s true. Thank you for listening, I rarely share this part of myself. Oh goodness, Pam – what an incredibly flawed doctrine you were taught! So heartbreaking to think of all the people thinking that *this* is what Jesus came and died for, that we would be agonizing over every sin believing that eternal life with Him was still an impossible journey. Jesus died so that we may have His righteousness in place of our own. Looking forward to seeing all God teaches you through this study – so glad you are here, Pam! Wow, I’m loving this already! Reading all these comments, reading over the intro a few times….I’m feeling challenged and inspired. I guess I do doubt, that’s hard to own up to, ya know? My areas of doubt center around the orphan crisis, abortion, and child neglect/abuse in general. It is so HARD for me to wrap my head around the suffering, the abandonment, the killing of children. I am always asking Him ‘Why” and “How” these awful things happen to the most innocent of people. As I am praying (asking Him the Whys and the Hows) as I am struggling with my doubt of His care and love for these children, His Presence does wash over me….. my faith grows and is stretched again and again and again. I succumb to His will, I find myself clinging to His promises of redemption and restoration. I feel His Peace. My doubt becomes smaller, His Love for me fills me. But I’m telling you this is a continual process for me. Like DAILY! And I feel guilty for doubting Him, I apologize to Him. If my heart is breaking, if my soul is filled with despair and sadness, I can only imagine His heart! Well, I probably can’t even come close to feeling His agony. However, I do know that my relationship with God is growing, even though I doubt, even thought I question…. I am communicating with Him, sharing my heart with Him. As I do this, He is enveloping me, taking me in, holding me close…..awwwww. This is peace. We are to have faith like a child……but as you all know, little children do have a ton of questions. great point…that little children do have a ton of questions!!! i serve in a non-profit that addresses human trafficking, so i understand your questions concerning the suffering of children. Wow, I love the way our study has started off! I’ve read through the responses so far, and I have to admit that I wrote my response yesterday sort of off the cuff, and I should probably give it more thought. Your responses are so articulate and really urge me to dig deep! One of the benefits of not growing up in church and accepting Jesus at age 36 is I don’t have an ‘inherited faith’ or beliefs. In fact, as a new believer at age 36 I questioned many things I heard and even took those questions to the Bible. As I’ve walked with the Lord for over 12 years now, I find it much easier to settle into the comfort zone and I’m less inclined to ask questions, maybe because of the present circumstances of my life, or maybe because I’ve become lazy in my faith. I can relate to Keller’s challenge for believers to dissect our doubts and beliefs. I love being challenged to exercise faith, but I’m not sure I could practically explain why I believe what I believe or do what I do, if asked by a skeptic. I hope at the end of this study I am able to give an answer for the hope that I have! The intro hit me pretty hard. It has been a tough couple of years for me,( moving 3 times in 4 months, my dad terminally ill with cancer committed suicide, dh and I weathered a very rough time), but I managed to hang onto Jesus and my faith, just pressing forward and not looking away from the fact that He holds me close always. It was a crazy ride but through it all I felt like my faith didn’t waiver. It wasn’t perfect, in fact it was downright ugly, but I held on. Now I am praying desperately about possibly moving to Guatemala and it pains me to say the thought of it has made me stop and actually say, “Is he really real? Will he really provide for my family?” As ashamed as I am to say after 15 years that I am doubting his existence I can confidently say that it is in my doubt and questions that he AFFIRMS his existence to me! How Glorious a God we serve! The Bible is not some house of cards that can be blown over with a whispered doubt. Ask your questions! Express your doubts! The answers are there on every page, and in the peace that surpasses all understanding. It was in my answered doubts and prayers for help that he has affirmed himself over and over to me. I am very hopeful that through this book I will be better to articulate that to my family and friends who feel like they “cannot believe in God because they believe in science. Or they have their own questions about how God could allow all the evil in the world. I think his challenge to christians will strengthen not only our argument for God, but our own faith in Him as well. Wow… what a testimony to His goodness, Amy. I love this thought of yours – “The Bible is not some house of cards that can be blown over with a whispered doubt. Ask your questions! Express your doubts! The answers are there on every page, and in the peace that surpasses all understanding.” So true! I thought of the Psalms when you said – ask your questions! Express your doubts! Thanks for sharing your story. I can relate to what Keller says about dissecting our cultural and spiritual beliefs—I think this is difficult because I believe our culture and religion is intertwined. I have experienced some very difficult times while a young child and as a teenager all of which seemed to culminate with an auto accident that left my mom a quadriplegic. She was only 38 and I was 16 at the time of the accident. I had stopped going to the Presbyterian Church we had attended since I was younger. Much of the congregation there was prejudice and a bit on the ‘self-righteous’ side. I am not really sure why mom remained there. At the time of the accident I became really angry with God. My mom had already experienced a really hard life—she was neglected as a child and had severe scoliosis. I had other trauma experiences and I felt like, “Really?! We haven’t been through enough now this?! ” I shut God out. I was done. I was done with God for about the next 16 years when I met my current husband. Just prior to meeting my husband I had made some really bad personal decisions and was at a crossroads of sorts. I am not really sure what or why, but I decided I wanted to ‘try’ God again. I thought about this for a few weeks and looked up a few things about prayer—it had been sooooo long. I tried contemplative prayer. The first time, I stopped within a few minutes. It felt weird to me. A few nights later I tried it again—it lasted a little longer and I liked the quiet, peacefulness I felt. After a few more times—I really felt God’s spirit embracing me, forgiving me and loving me. So now, I don’t always like what is thrown my way and I have my doubts, but instead of shutting God out—I talk to him about it; even if I am angry at Him, I talk to him because it is better than shutting him out. I also take time to recognize all that is wonderful and Thank Him. I agree Reena, talking to Him is always better than shutting Him out. It seems I cause myself the most pain when I try to handle things on my own. His is the biggest and best lap to rest in, always full of love, compassion and understanding. I think my default is to have an underlying foundation of faith in God. My doubts are usually about the enormity of it all. A God that created everything. A God that always has been. A God that always will be. Loves me enough to send His son to die. A God that is sovereign. It’s too much for my little mind to process sometimes. I once heard a sermon that referred to Thomas as “Courageous Thomas” instead of “Doubting Thomas” because he had the courage to face Jesus and tell Him that he just wasn’t sure about everything. He had courage enough to tell Jesus that he needed proof. I like that. I think Jesus was ok with it, too. Hi Angie– that is what I think, “where understanding ends is where faith begins.” I believe in science, evolution: evolution within creationism. Science may explain a lot, but not everything and where does science even come from? I’m loving everyone’s comments. I grew up in the church and have always held to my “inherited beliefs.” My entire life has been spent in the Bible Belt where I am surrounded by other believers and have never really been challenged to defend my faith. Apparently, I need to get out more! As some of you have said, my faith in God is strong, but I have trouble explaining why. As my children get older, they are asking tough questions about how God came into existence, how He could create an entire world, how dinosaurs fit in with the creation story, etc. ; and it’s really starting to hit me that I have never examined why I believe what I do. I’ve had my own doubts about these same issues, but I never pursued answers — partly due to thinking it was wrong to question God and partly out of pure laziness. I know that our human minds can’t fully comprehend all that He has done and will do, but I think the author is dead on when he says “Believers should acknowledge and wrestle with doubts – not only their own but their friends’ and neighbors’. It is no longer sufficient to hold beliefs just because you inherited them.” Feeling challenged — and I need that! Y’all are all so articulate! Feeling a little nervous about writing to y’all….thinking I just want to read what you have to say! Which leads to one of my doubts…. I think one of my biggest doubts stems from a people pleasing mentality. I want to always do The Right Thing. I don’t want to rock the boat unnecessarily. I don’t want to disappoint anyone And as much as I tell my girls that it doesn’t matter what other people think about you, it is hard to live by that rule inside my own head and heart. That thought process spills over to my relationship with God. I don’t want to disappoint Him. I want that checklist that I can look at and know I have ‘done it all’. I feel I am constantly trying to earn His love. How could it be free? How could He just choose to love me when I feel so unlovable? What can I do to NOT be a disappointment to Him? Yet, how in the world can I NOT disappoint Him??? I mean, I know myself on the inside. I know I am like Paul in that I don’t always do the good that I want to do, but so much more often the bad that I don’t want to do is what wins. So, I doubt God’s love for me b/c so many times I don’t love myself. It is just so difficult to truly believe. I see evidence of His love and provision in my life. I know He is there. I grew up singing Yes, Jesus Loves Me. But so often I don’t love me, so how can a perfect God love me? Sometimes I feel as if I don’t know who God TRULY is. I am reading the One Year Bible. And I have to be honest. There have been parts of the Old Testament that made me go, SERIOUSLY? How can a loving God do or say those things? How can this be the same God that sent His son to die for my sins? It just seems so disconnected. Like they are two different Gods. “How can a loving God do or say those things? How can this be the same God that sent His son to die for my sins? It just seems so disconnected. Like they are two different Gods.” Yes! I’ve felt the same way. “Feeling a little nervous about writing to you all” I am there and just about everything you stated I can relate to. Did you read my mind when writing this? Nervous about what to say….check. People pleaser…check. Rambler…check. God has been working on me with the people pleasing thing a lot too. I’m still a huge work in progress. My ex-boyfriend was a perfectionist and I tried so hard to be perfect for him. Everything I did was wrong, even the way I did the dishes. It was a nightmare of a relationship, but I saw it as me being a failure. I think God used that to show me how much I was depending on the gratification of other people and trying to please them no matter how much it hurt me. No matter what I did, it was wrong to him and I was beating myself up about it. God reminded me that HIS opinion was the only one that mattered. I still struggle with it a lot, but am definitely getting better at trying to not let other peoples opinions matter. As I read your question from the study, I couldn’t help but think about the story in Mark 9 when Jesus heals a boy who has an impure spirit. Jesus tells the father of the boy that Everything is possible for one who believes. The father then cries out, I believe! Help me in my unbelief. I sometimes feel like that father especially when I’m praying for people I love who have serious, life threatening illnesses. I KNOW God can heal them but then I wonder if He really will. Or just sometimes with the craziness of life when I don’t make time for God like I should then those little doubts start to creep in – not often but usually when I feel I’m at a low point. I do believe! It’s my hope! I don’t see how people can truly live in this world if the don’t have the hope of Jesus being all that he claimed to be. I agree with Tim that we need to reflect on our doubts and see where they come from and how we can break them down. Wait, wait! I’m not ready and y’all have made 55+ comments! How will I ever catch up?? Most of my doubts come from the bible itself. Some of the things that it says are so amazing and beautiful. Other things seem awful and hateful. I feel like I, along with many others, pick and choose what I want to follow and what I’d like to pretend doesn’t exist, while dismissing many things as “cultural.” Another thing is the difference between the stern and fierce Old Testament God and the loving New Testament God. And yet another thing is some of the things that God does or the things He has people do for Him in His name, like when during the Plagues of Egypt God kills the children of the Egyptians. I know I believe in God, but I feel my faith wavering on the Biblical details. Gals, I am loving the honesty and it is so refreshing! For sure, I can relate. I think it is healthy to dissect our personal and cultural doubts – with each other and with God! Pervasive doubt – well, I am currently on the same page with a lot of you all. How is God everywhere at all times AND seeing/listening to everyone AND taking care of this entire universe? I’m seeing that subconsciously I have pictured that omnipresence a bit like Santa Claus. Kind of like this, “Santa brings toys to every single kid on Christmas night!” (*wink*) which somehow seeps over to, “God can be everywhere, all the time, and care for everyone!” (*wink*). Let’s just go along with it and nod our heads and say we believe…I’m done with that. I’m ready to dig in, take the sweet pictures of His omnipresence that He has been so kind to reveal recently, and wrestle with this doubt! YES!!! I feel as a Christian I absolutely need to dissect both personal and cultural doubts. Both dissections are instrumental in growing my faith and my relationship with Christ. The personal dissection is where it starts to step on my proverbial toes a little! Yes, as believers, we need to dissect our personal doubts. I swear my personal mantra has been, “Lord I believe, Help my unbelief!!! !” Mark 9:24. It is normal and natural to have doubts in our faith. If we did not question then how would our faith be any more than rote memorization or inherited from our parents and society. Yes, to doubt is healthy. To leave the doubt unquestioned and undirected, however, will wreak havoc on our faith. We must be willing to take that doubt to the Lord and seek His face in all things; asking Him to make clear the obstacles standing in our way of a pure, undefiled faith. Leaving the doubt unchecked gives Satan a foothold that I, for one, do not want him to have. I’m in line with what Rachel (waaay back up there) shared – God is personal to me? Really? And loves me? I did things WELL BELOW the morals I was taught in VBS and Sunday School? I loved how another someone above struggling back to faith shared about contemplative prayer. I’ve just started trying it and it helped to hear someone else is too. i have to preach the gospel — this love of His — to myself often because it is really too amazing to comprehend! Not much for posting- prefer lurking :-)- but, having agreed to weigh in with my thoughts, I thought I would try on the first post. My most pervasive doubt is that, when really tested- you know, trial by fire- that my faith will stand. It is all well and good to be faithful when I am living a life that is abundantly blessed. It is quite another thing to stand tall in faith when I am under assault and can see no end in sight. Ooh, Teresa. That is definitely one I have struggled with. I have read in the Bible how Christians were persecuted and I wonder, “What would I do?” and really don’t like my honest answer. Studying Daniel has helped me to understand the importance of a relationship with God now, when things are ‘good’, then when tough times come, I hope to have a ready response based on my faith and won’t need to rely on my flesh to respond properly. Yes I can relate…..can you imagine some of the early Christians and how they were persecuted? I’m not sure that I would be that brave! Also makes me think about that pastor currently in prison in Iran. I want to think that I would be able to stand up for my beliefs but in those circumstances would I really? I am trying to find my way to a relationship with God that is based on love and not on fear – and that won’t happen unless I start to tackle my doubts. Some of my doubts are personal. Rachel’s and DeeDee’s comments really resonated with me. How can He love me all the time? When I know me on the inside – and know how lovable I am not – and how not worth loving I am sometimes? Another personal doubt is have I turned away for so long is it too late to come back. Your comments are making me really think about things I hadn’t (or hadn’t wanted to). After reading the first few posts, I felt (and still feel) like emailing Stefanie and saying, “See? I told you I wasn’t ready enough for this. Take my name off the list. I can’t do this.” But I think that feeling means I’m supposed to be here – right now – tackling this. I doubt (no pun intended) that I have much of value to contribute, but I have no doubt that I will learn much — and this is only the trial run! I am grateful for this study and to Stefanie for hosting it. Clara, I am so, SO glad you are here. I think the key here is to focus less on our unlovableness, our flaws and our sinfulness. Instead, if we put our eyes on Jesus, and dig deeply into who HE is, the sacrifice HE made and the way HE revealed His love for us through His death on the cross for US, then we understand how much He does love us – flaws, sins and unloveliness and all. That’s what makes Him so incredibly amazing. And so worthy or our love in return. I’m glad you’re here too! Trust me, I don’t feel qualified either. I felt like God was leading me to do this, so I decided to jump. As frightening and scary as it was to take that first step, I already feel like I’m learning so much and it is so worth it. Stefanie, I did not sign up for this study as I felt so badly about not being able to give the previous study my full attention. However, I am going to go to the library and ask them to get this book for me! I will be reading along and while I am not an official participant, I cannot wait to dive into this book!!!!! Thank you so much for helping me to explore and expand my faith! I am enjoying reading all the posts and feeling much better that so many share some of the struggles that I have experienced with the “doubt” factor. I have never doubted God’s existance. Being brought up in church I have always felt He was a part of me just as much as my parents were. As I got older and did start to have doubts (like Kelly P.mentioned) where I questioned beliefs that had been ingrained in me by my parents and my church. Was I to accept them as if inherited or dig deeper to see if they really were my beliefs? As Angie commented, the enormity of it all has always blown my mind. When I am taking a night time flight and look down at a big city before landing and see all the millions of lights shining, I always think-how could God possibly be everywhere for all of these people and hear each and everyone of their prayers.. and this is just a small piece of the world.. That is overwhelming to me. First, I want to thank you Stefanie, for organizing this study. I would never have picked up this book, let alone joined a group study if I had not been following your blog for the past year or so. I admire your faith and know I will learn a great deal by participating in this group. It will force me to get out of my comfort zone. I love how articulate and honest the replies have been. Where am I in my faith and doubts? While I grew up in a Christian family and attended Sunday school and Church each week, I no longer do so. I have always believed in God, however I have had the doubts addressed in this book at one time or another. I am looking to grow in my faith and less in my doubts as I progress thru the study. After reading these comments I was first a little intimidated with all of your impressive and articulate responses. But then I realized that this is why I was trying this avenue of “small group” because I liked the anonymity of it all. Does that make sense? What I have personally struggled with lately is turning off my “logical – organized – planning for the future” mind and just completely TRUST in the Lord. To have no doubts that He in Control and LET Him guide me is really hard. I want to plan everything out and I know that it’s not supposed to be that way. Now we all could argue that even with my planning and preparing that ultimately it’s still His plan, but how do I just learn to Lay it ALL down at His feet and give up this urge to control all the aspects of my life?? This is where my doubt smacks me in the face time and time again! My confidence in my beliefs comes from two places ~ (1) having been raised in an environment where there was no other option but that God was real and (2) by seeing the calm and peace in the lives of my peers who are sold out following God. My doubts, in contrast, seem to creep up as I try and apply what i know in my head to my emotions and heart. While I know that God is active and caring and real, I don’t often feel this. I know I should listen to God’s guidance; but don’t know that I honestly believe he’ll talk to me. I guess I doubt my importance in the scheme of things or perhaps doubt God’s concern for each individual one of us.